Noticing New York: WNYC Reports Mayor de Blasio’s “Furiously Raising Funds”- Including From Developers “Lurking Behind The Curtain” of Library Real Estate Sales- And WNYC’s Money? WNYC Reports Mayor de Blasio’s “Furiously Raising Funds”- Including From Developers “Lurking Behind The Curtain” of Library Real Estate Sales- And WNYC’s Money? 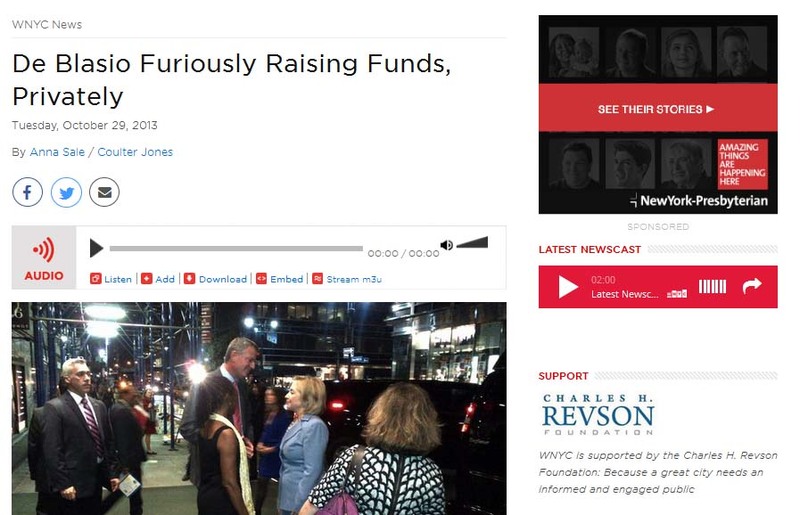 Here’s a link to a WNYC report: De Blasio Furiously Raising Funds, Privately, by Anna Sale. The article, informative and newsworthy mostly as long list of “who is helping” de Blasio, channeling big bucks to his door. It doesn’t say who is bringing how much and you have to guess who is bringing the most. You can make some good guesses though. As you’d suspect the city’s heavy-hitting real estate developers are well represented: William Zeckendorf, the Sitt Family, Larry Silverstein, Fred Heller, Robert Levine and Ronny Levine, Mike Muse and Jason Muss, Ron Moelis, Gary Barnett, David Von Spreckelsen, Donald Capoccia. 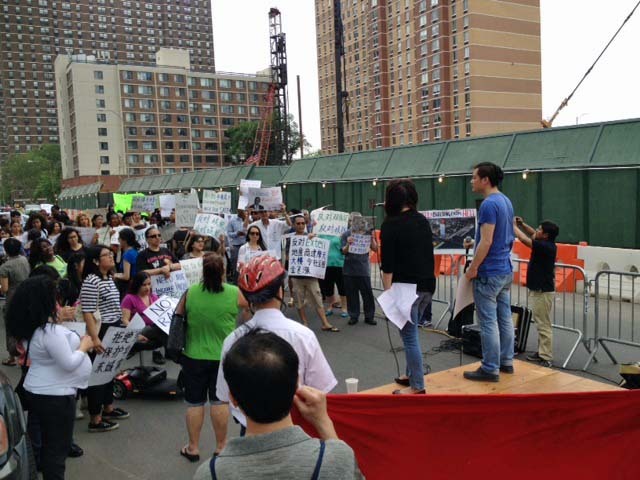 A May 27th demonstration against Gary Barnett's Extell gentrifying 227 Cherry Street development that wiped out the local supermarket on the Lower East Side. You also have people representing them like real estate lawyers Douglas Eisenberg or John Zuccotti, immortalized by having the private park from which Occupy Wall Street was evicted named after him. There are, of course, lobbyists: Peter Vallone Sr., Sid Davidoff, Ken Fisher. And then there are many others who may or may not have brought in that much money and who are likely on the list for reasons unconnected with real estate, in some cases perhaps because they even have altruistic hopes in common with the rest of us for Bill de Blasio’s future as mayor: Abby (Abigail) Disney, Emily Madoff, Yetta Kurland, Debbie Almontaser. Attorney Jim Walden is on the list perhaps because in 2013 he was representing a huge public constituency hoping that de Blasio in his ascension to office as mayor would be key in defeating the sell-off of Long Island College Hospital as part of a plan to turn that facility into waterfront condominium towers. 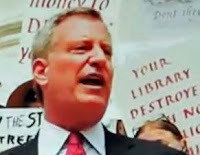 No such luck: Mr. de Blasio wimped. No doubt the reason that WNYC did an information dump of all these names for the public to analyze is the supposition that all these people sending money de Blasio’s way wanted him in office and to influence his decisions in office. People that are particularly interesting on the list in one respect are the people connected to the selling off of New York City libraries, shrinking them to squeeze the best out of the real estate deals that materialize as a result. David Kramer of Hudson Companies Development is on the list as is Jonathan Marvel of Marvel Architects. Their fund-raising at this time was concurrent with Kramer and Marvel having a pending application in with the city to buy and shrink the Brooklyn Heights Library, Brooklyn’s central destination library in Downtown Brooklyn on Cadman Plaza at the corner of Tillary and Clinton. Eleven months after Kramer and Marvel flowed money to de Blasio’s campaign and nine month’s into de Blasio’s term as mayor, the de Blasio administration decided that the Kramer and Marvel application would be the one selected if the sale and shrinkage is approved to go forward. The sale will entail a substantial loss to the city with library being shrunk down to one-third size. 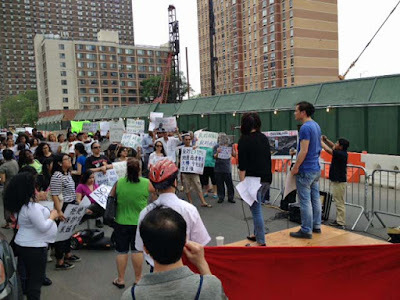 As a technical matter the process to obtain that approval will commence with a hearing before Brooklyn Community Board 2's Land Use Committee on Wednesday, June 17th. * The process will take at least 18 months, perhaps as much as two years, and will require de Blasio’s sign-off before it is complete. A week ago de Blasio told one of the activists opposing library sales that he has not made his decision on the sale yet, but there are plenty who cynically believe he has already committed himself privately to the developer. The developer David Kramer and I live in the same neighborhood, Brooklyn Heights, which the other day resulted in our meeting and a discussion about the proposed library sale giving a young man who was present an impromptu civics lesson. David described Citizens Defending Libraries and its opposition to the city’s transformation of libraries into real estate deals as being part of the “checks and balances” of the system. I continued this discussion with him May 27th at a community board meeting where the library administration officials had flogged the plan to sell and shrink the library. I asked him what check and balance there was to the influence of his money and the money of the real estate industry when it came to library sales. He said he hadn’t given any money and that money wasn’t a factor in the process. . .
. . . However, here is record of $4,725.00 going directly from Mr. Kramer to de Blasio’s coffers. 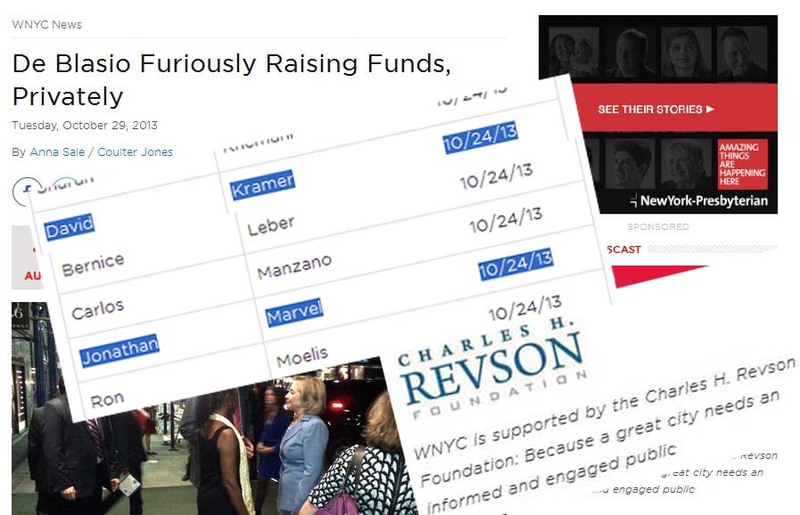 Not on the list published by WNYC is any fund-raising by Forest City Ratner for de Blasio which was prolific, the Daily News reporting on Bruce Ratner and associates sending $73,000 de Blaio’s way. Forest City Ratner is important because Forest City Ratner is positioned as a gatekeeper able to also benefit from the Brooklyn Heights Library sale. It was former Forest City Ratner vice president Karen Backus who created the BPL’s still secretly held “Strategic Real Estate Plan” to “right-size” Brooklyn’s libraries by “leveraging” all of the system’s real estate while prioritizing for sale the two libraries next to Forest City Ratner property, the Brooklyn Heights Tillary Clinton library being one and the Pacific Branch the other. The rationale was to sell the most valuable libraries first, but those are also the libraries most valuable to the public. What’s considered next most valuable will be seen as the BPL moves down the list. WNYC’s October 2013 list did have others involved in the library sales. Among them is Nicholas A. Gravante, Jr. a lawyer that his firm spotlights for trial victories, including “winning an acquittal for three leading New York City real estate companies indicted under the Martin Act” (that means the firms were indicted for making misrepresentations to the public). Gravante is a board member and is now currently chair of the Brooklyn Public Library board pushing for these library sales. Other members of his Boies Schiller & Flexner law firm were also on the WNYC list: David Boies and Christopher Boies. 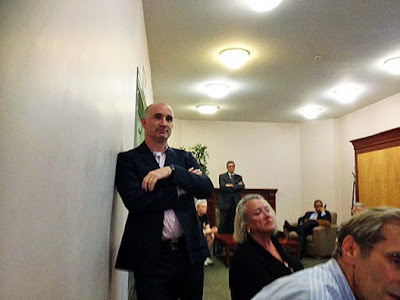 Lastly, Joe Sitt (the Sitt Family was on the list) is a developer who is likely to have benefitted in ways that have yet to be publicly analyzed and discussed if the part of NYPL's Central Library Plan involving the proposed sale of Mid-Manhattan Library were ever to move forward. I wrote above that no doubt the reason that WNYC furnished the list of the names of all these people funneling money to de Blasio is the supposition that the money was intended to have influence.. . . The irony? 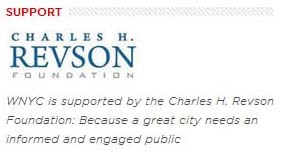 The Charles H. Revson Foundation has been suspiciously in the background and supportive of turning New York City libraries into real estate deals. (See: Thursday, June 6, 2015, Where Are They Now? : Sharon Greenberger, Evercore and the Revson Foundation- Selling And Shrinking NYC Libraries.). . . . It may be one of the reasons that WNYC reporting on the sale of libraries, something that should be a very important story, has fallen quite short of the mark. The Revson Foundation gives WNYC big money: In the years 2010 to 2015 the Revson Foundation has given to WNYC (or in one case one of its projects) a total of $1.78 million. WNYC says that its news reporting is not affected by the sponsors that ‘donate’ money. WNYC, which now has Forest City Ratner head MaryAnne Gilmartin on its board, also takes sponsorship money from Forest City Ratner, in return for which it has run what are essentially advertisements for the firm. WNYC has regularly been a publicist telling the public volumes of what the Revson Foundation wants known about how it is spending its money. It has not, however, reported about what is going on behind the scenes to turn libraries into real estate deals.